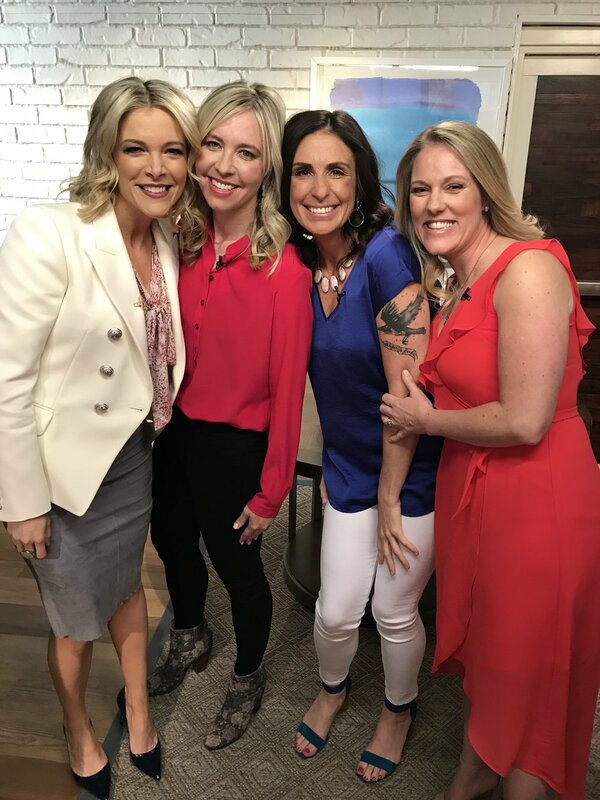 So, last week I was on Megyn Kelly TODAY with a panel of women talking about motherhood and drinking. National, live TV was about as surreal as I imagined, but also way more fun and fascinating, too. I’ve been saying it was like visiting another planet for a few hours—one where everyone had exceptional make-up and hair and knew exactly what to do next and when—who knew? As I’ve been digesting the experience, a few things have come up that are worth addressing. First, I’m thrilled this conversation is happening at all and I commend Megyn and her producers for having the guts to bring it onto their show knowing it could be touchy, if not wildly unpopular with their audience. I mean, Kathy Lee and Hoda have done the jokey wine swilling thing during the most popular TODAY hour (10 am on the east coast) for years. They've even dubbed Tuesdays "Boozedays" and Wednesdays "Winesdays." When questioned, the network has responded that it's not real wine in the glasses. HAHAHAHAHA. THAT'S SO MUCH BETTER YOU GUYS THANK YOU FOR CLARIFYING. When I shared the segments on social media the most prevalent comments were about the ads that ran before, during, and after the show. Apparently, they were all alcohol ads. Doesn’t NBC have smarter advertising algorithms? one person asked. My response: They have brilliant algorithms. Those are just the ads that regularly run at that time because its when the large percentage of the buying demographic has their eyeballs on the screen. Morning television = women and moms. It’s the water we’re swimming in. Alas, and again, I’m so grateful this conversation is beginning to happen. It wasn’t there just a few years ago when I was trying to get sober. In the past year, especially, there’s been a marked turn in how the media is covering drinking, particularly as it relates to moms. This piece I wrote last summer got picked up by Huffington Post Canada. Earlier this spring, The New York Times ran a piece titled Being a Sober Parent in a Wine Mom Culture and just a couple weeks ago, The Chicago Tribune ran a piece about boozy mom culture going too far, featuring Kelley Kitley, one of the moms who sat on the TODAY panel. This is just a sampling; there are so many strong voices in this space. Annie Grace, Erin Shaw Street, Anne Dowsett, and Aidan, who also sat on the panel with me, are just a few. It’s happening—very, very slowly, but surely. Since the show, my friends and family have asked if I’m happy with how it went. Did I say what I wanted to say? Do I wish I would’ve said anything differently? Although l’m not really one to wish for do-overs that can’t happen, there is one thing I wish I could change. The first question Megyn asked me was about what my drinking looked like at the end. I stumbled around with the question because I wasn’t really expecting it, and ultimately I said something about how it wasn’t uncommon for me to drink two bottles of wine in a night. And while it’s true, the “how much” question is so beside the point. What I wish I would’ve said, and what is far more important and true is that it doesn’t matter how much you drink, or how often, but what happens to you when you do. The truth is that yes, sometimes I drank far more than two bottles in a night. But sometimes I only had two glasses. The effect was the same. I felt varying degrees of physical sickness the morning after, but always, always, always I felt anxiety. Shame. And this deep knowing that I was blotting out my own existence. The question and my answer have nagged at me because I know in the past I would’ve used that kind of information to compare my own drinking and classify it as not that bad. The truth is there’s always someone who’s worse: drinking more, drinking differently, suffering uglier consequences. That kind of thinking kept me drinking and in pain for a long time. Luckily, what Aidan and Kelley articulated so well on the show was exactly that: it doesn’t matter. The issue of drinking among women is no longer a black and white issue. You don’t need to, as Aidan said, “have an epic problem that requires an intervention” for drinking to be messing with your life in a really epic way. So. That’s what I would have changed. I also might have suggested a more…empowering?…segment title than Mommy Burnout. Not my favorite. Baby steps. And, lastly, I would 100% be down with getting my makeup and hair done daily. That business was magic. Aidan trying to help wardrobe do their job in the green room. :) She caught herself and we laughed hysterically. I love her.